When Personal Security Operator Leonard Howell’s seventeen year old daughter Caroline is kidnapped (and a ransom issued), he turns to people he trusts to help get her back. One of them is a name from his past - Eddie Flynn, a con-man now turned lawyer. Though the third in a series novel featuring Flynn, The Liar can be easily read as a stand-alone Legal Thriller, and one that is outstanding. Eddie is the go-to-guy for Leonard as our anti-hero has lived through the same nightmare with his own child Amy. Eddie agrees to help, but soon realises that someone is pulling strings in a way that even he (with the benefit of his con-artist background), never saw coming. So with the FBI, the Police, the context of the kidnapping as well as suspicions about the man he agreed to help, Flynn finds himself in the centre of a web of deceit. Eddie soon has to employ both his legal-skills as well as his street-wise nature (in equal measure) if he's going to get through this case intact. Coupled to this case of the missing teenager comes another problem, creating the courtroom drama and a connection that could destroy the career of Judge Harry Ford, a man that Flynn owes deeply. Steve Cavanagh’s work is taut, terse with every scene-ending leaving you wanting more - until dawn breaks. The premise of the hustler turned lawyer is handled deftly preventing the narrative falling into parody, while the plot is populated by fully-formed characters. 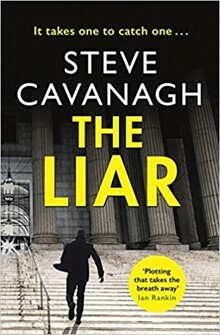 When coupled to the New York backdrop, it’s of little surprise that Cavanagh’s work currently resides with the very best of the legal thriller subgenre.